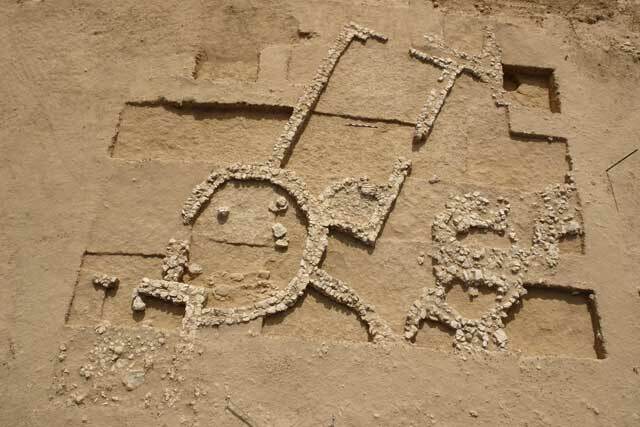 During May–June 2007, a salvage excavation was conducted at the site of Abu Qurinat (Permit No. A-5138; map ref. 195883/559016), prior to the installation of a gas pipeline. The excavation, undertaken on behalf of the Israel Antiquities Authority and underwritten by the Israel Natural Gas Line Company, Ltd., was directed by S. Talis, with the assistance of H. Lavi (administration), A. Hajian (surveying), the Sky View Company (aerial photography), N. Zak (drafting), C. Amit (studio photography) and A. Dodin (drawing). 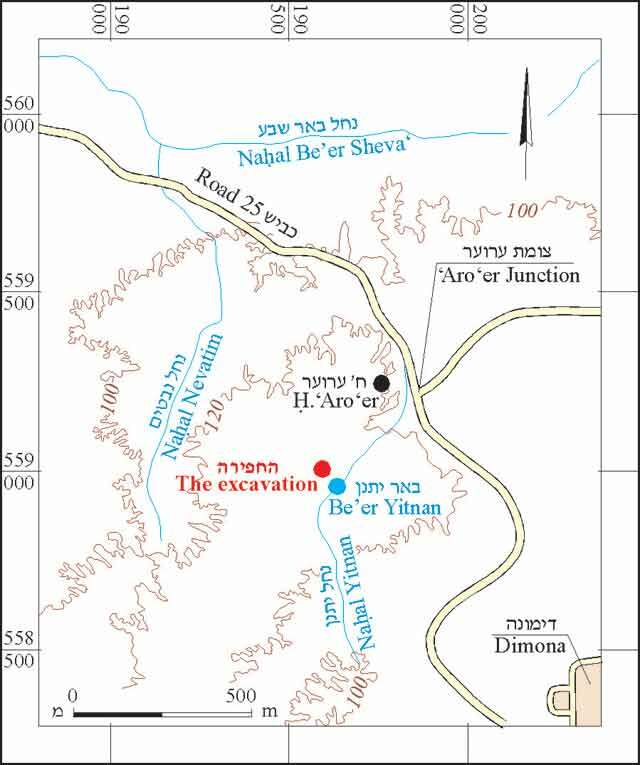 The site is located in the southern part of the Be’er Sheva‘ Valley, c. 24 km southwest of Arad, 12.5 km south of Tel Malhata (the smaller tell) and c. 6 km south of Tel Asdar (Fig. 1). 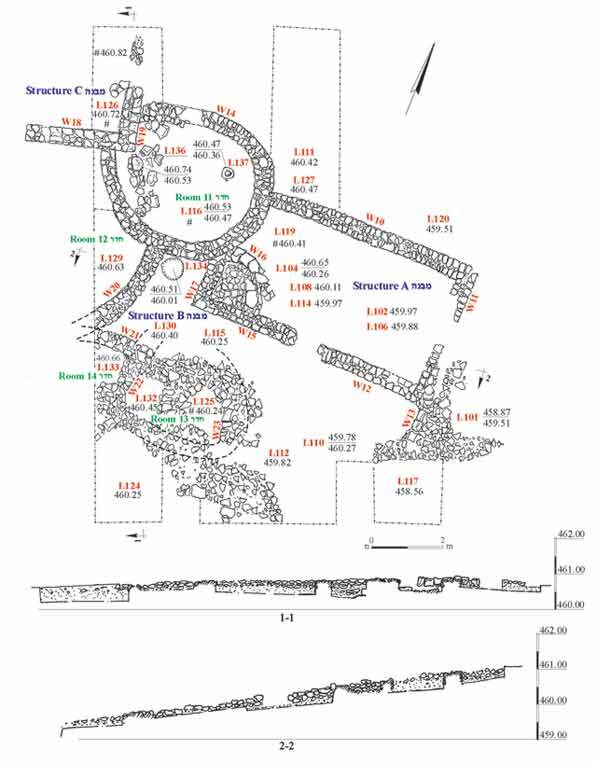 A survey, prior to development work in the region, revealed a site (88×100 m) that dated to the Early Bronze Age; tops of walls were discerned and potsherds and flint artifacts were gathered. The site is located on the eastern slope of a hill, composed of flint and qirton, c. 150 m west of Nahal Yitnan. The northeastern end of the site was examined (143 sq m). Remains of three buildings from three phases, dating to Early Bronze Age I (Figs. 2, 3), were exposed close to surface. The early phase (3) consisted of a broad house (Building A); the intermediate phase (2) had a building that was a complex of circular rooms (Building B) and part of a square building (Building C) belonged to the late and last phase (1). The walls, founded on natural soil, were built of two rows of roughly worked limestone and flint. The bottom parts of several rooms were dug into the natural loess soil to a depth of c. 0.1–0.2 m below the foundations of the walls and a tamped-earth floor was discovered at their bottom. The entrance to these rooms was at the elevation of the base of the walls and it was therefore necessary to descend from the entrance to the floor of the room. Pottery vessels dating to Early Bronze Age I superposed the floors of all the buildings. The find assemblage at the site consisted of various hole-mouth vessels, jars and bowls, stone vessels, querns, pounding vessels and flint tools. A broad-house structure was exposed in the eastern part of the excavation (Fig. 3). The building had a rectangular plan (4×7 m) and was delimited on all sides by walls (north – W10; east – W11, south – W12/15, west – W17) that were preserved three courses high (0.28–0.37 m). Wall 11 was only partially preserved. The entrance to the building was set in the center of W13/15. A semicircular stone-built installation was exposed inside the southwestern corner of the building, which was formed by Walls 15 and 17. The installation was delimited by a curved wall (W16) built of large fieldstones, whose one end abutted W15 and the other—W17. The area between Walls 15, 16 and 17 was paved with medium-sized fieldstones (L119). Since no artifacts were discovered in the installation, it is impossible to determine its use. The interior of the building contained layers of natural loess (L102, L104, L106, L108 and L114) that were deposited after the building was no longer in use. The northwestern corner of the building was disturbed when Building B (Phase 2) was constructed. 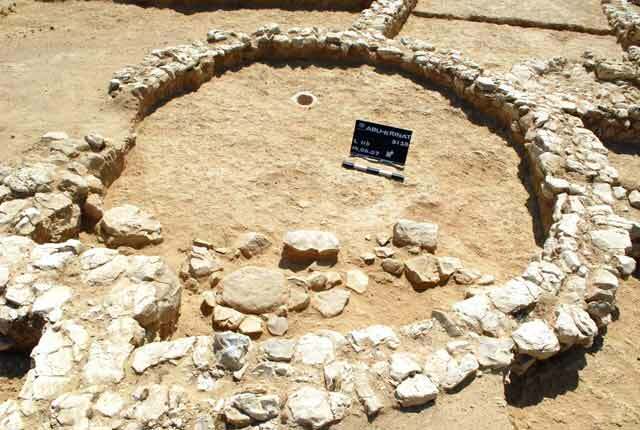 An elliptical or circular building that consisted of four rooms was discovered. The stone walls of the rooms were bonded with each other. One room (11) was entirely exposed; the other three rooms (12, 13, 14) were only partially excavated due to their poor state of preservation and the restricted boundaries of the excavation area. Room 11 was elliptical (3 m north–south, 4 m east–west) and delimited by a wall (W14; height 0.26 m) preserved three courses high. The northwestern corner of Building A was severed by the southeastern side of W14. The entrance was set in the northern side. The interior of the room was covered with stone collapse. The bottom part of the room’s interior was excavated c. 0.1–0.2 m below the base of the wall and at its bottom was a tamped-loess floor (L116) founded on top of natural loess. A flat dressed stone, which was almost completely surrounded by small stones and may have been a work surface (L136; Fig. 4), was discovered on top of the floor in the western part of the room. A concentration of other stones that had been placed on the floor was found south of the surface. These were probably other installations, but it is impossible to determine their shape or function due to their poor state of preservation. Two hearths, two querns, fragments of storage vessels and table ware, as well as flint tools, were discovered on top of the floor. A hard limestone bowl, probably a mortar (L137; Fig. 5), was set inside a depression, dug in the floor of the eastern part of the room. 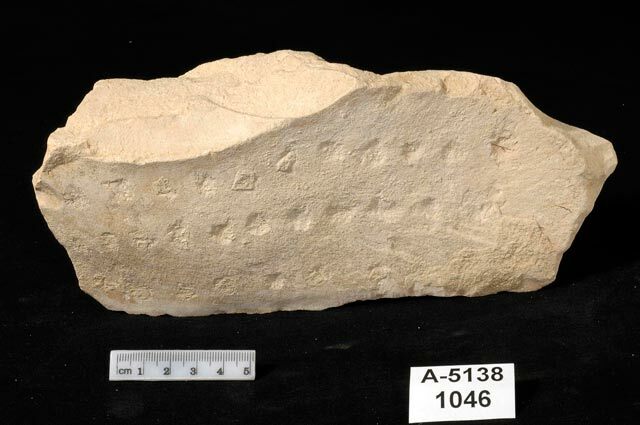 Several Egyptian pottery vessels and a senet game board, made of hard limestone (L111, L127; Fig. 6), were found inside stone collapse east of this room and next to W14, where Buildings A and B meet. Room 12 was circular and a section of it was exposed next to the southwestern part of Room 11. Its enclosing curved wall (W20; height 0.29–0.33 m) was preserved three courses high and adjoined W14. The interior of the room was covered with loess (L129) that contained fragments of a few pottery vessels. The floor of the room was not identified. The wide opening in W20 indicates that it probably delimited the courtyard of the building around which the rooms were constructed. A small ash pit (L134, diam. 0.6 m, depth 0.5 m) dug into the loess soil (L130) was exposed east of the building, in the corner where Walls 14 and 20 meet. The rim of the pit was c. 0.1 m below the bases of the walls, similar to the elevation of the rooms’ floors. Room 13. Remains of another circular room were exposed in the southwestern part of the excavation area. Two sections of a wall that enclosed the room (W22, W23; height 0.13–0.20 m) and was preserved only a single course high, were identified below a considerable amount of stone collapse. Below the stone collapse was a section of a tamped-earth floor (L125) in the eastern part of the room and a quern was found on top of it. It was not possible to locate the room’s entrance due to its poor state of preservation. Room 14. A wall (W21; height 0.15 m), preserved a single course high, was exposed between the western side of Room 13 and the eastern side of Room 12; it was the northern wall of another round room (14), of which only a small section was exposed; loess was found inside it (L133), yet no floor was identified. The southeastern corner of an apparently rectangular building was exposed at the northwestern end of the excavation area. The building severed a section of the curved wall of Room 11, which belonged to Building B. The walls of the building (W18, W19; height 0.20–0.26 m) were preserved one–three courses high and collapse of small fieldstones was discovered inside it. Its bottom was excavated c. 0.1 m below the bases of the walls and a tamped-earth floor (L126) was exposed. Two hearths, ceramic storage vessels and a few flint artifacts were found on top of the floor. The three buildings exposed at the site belong to three construction phases and form a small part of a rural settlement whose remains extend west of the excavation area. The finds recovered from the buildings, such as querns and pounding vessels, indicate that they were dwellings. 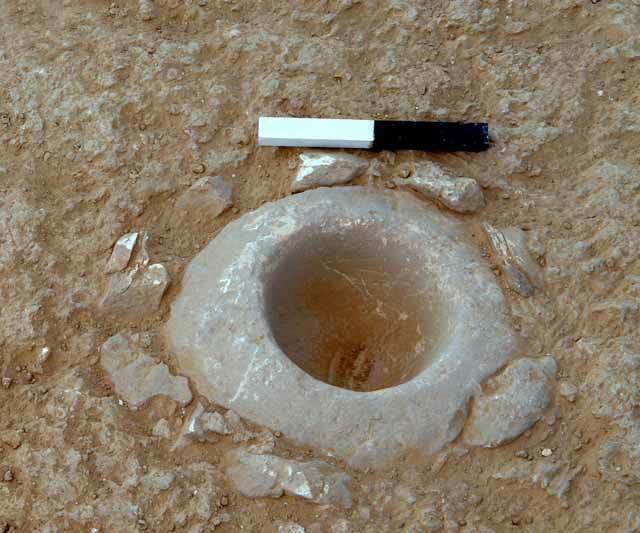 The site is one of the open settlements that were established in and near the wadi valleys in the southern part of the Be’er Sheva‘ Valley and in the Negev Highlands during the Early Bronze Age. Settlements such as these are characteristic of the period and testify to the significant increase in the population density at the end of the fourth and the beginning of the third millennia BCE. 4. Room 11, looking northeast. 5. Room 11, mortar, looking east. 6. A stone game board – senet.